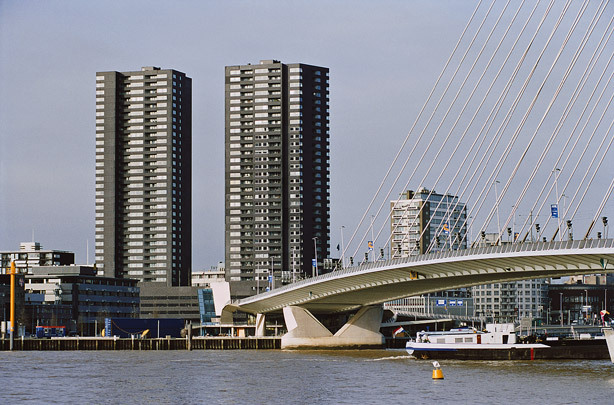 Two residential tower blocks stand on a filled-in harbour basin (Gedempte Zalmhaven) near the foot of the Erasmus Bridge. Altogether the two towers boast 285 up-market apartments. The two are joined by a plinth which includes the entrance, a parking facility and an internal street linking the lift lobbies with the towers. Communal amenities - panorama lobby, swimming pool, sauna, fitness centre, roof terrace - are on the fifth floor. The facades consist of black concrete cladding elements with a cobblestone effect created by using rubber moulds as formwork.